What is a Talar Dome Lesion? The ankle joint is composed of the bottom of the tibia (shin) bone and the top of the talus (ankle) bone. The top of the talus is dome-shaped and is completely covered with cartilage—a tough, rubbery tissue that enables the ankle to move smoothly. 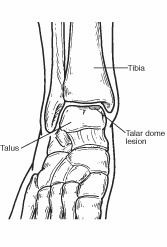 A talar dome lesion is an injury to the cartilage and underlying bone of the talus within the ankle joint. It is also called an osteochondral defect (OCD) or osteochondral lesion of the talus (OLT). “Osteo” means bone and “chondral” refers to cartilage. Talar dome lesions are usually caused by an injury, such as an ankle sprain. If the cartilage doesn’t heal properly following the injury, it softens and begins to break off. Sometimes a broken piece of the damaged cartilage and bone will “float” in the ankle. A talar dome lesion can be difficult to diagnose, because the precise site of the pain can be hard to pinpoint. To diagnose this injury, the foot and ankle surgeon will question the patient about recent or previous injury and will examine the foot and ankle, moving the ankle joint to help determine if there is pain, clicking, or limitation of motion within that joint. Sometimes the surgeon will inject the joint with an anesthetic (pain-relieving medication) to see if the pain goes away for a while, indicating that the pain is coming from inside the joint. X-rays are taken, and often an MRI or other advanced imaging tests are ordered to further evaluate the lesion and extent of the injury. Immobilization. Depending on the type of injury, the leg may be placed in a cast or cast boot to protect the talus. During this period of immobilization, non-weightbearing range-of-motion exercises may be recommended. Oral medications. Nonsteroidal anti-inflammatory drugs (NSAIDs), such as ibuprofen, may be helpful in reducing the pain and inflammation. Physical therapy. Range-of-motion and strengthening exercises are beneficial once the lesion is adequately healed. Physical therapy may also include techniques to reduce pain and swelling. Ankle brace. Wearing an ankle brace may help protect the patient from re-injury if the ankle is unstable. If non-surgical treatment fails to relieve the symptoms of talar dome lesions, surgery may be necessary. Surgery may involve removal of the loose bone and cartilage fragments within the joint and establishing an environment for healing. A variety of surgical techniques is available to accomplish this. The surgeon will select the best procedure based on the specific case.